Texas state policy allows students to earn dual credit for academic or CTE postsecondary courses taken at their high school, a postsecondary institution, or virtually. It is unclear whether public postsecondary institutions in the state are required to accept dual-enrollment credits (ECS, 2015). The Communities Foundation of Texas (Texas High School Project), Gateway to College National Network, Middle College National Consortium, and National Council of La Raza have partnered with institutions of higher education to provide 18 Early College High School programs as part of the Early College High School Initiative (ECHSI). Texas also has many “affiliated schools” that “are not part of the [ECHSI] but participate in the [University Park Campus School] Institute, adhere to the ECHSI Core Principals, and are funded by the Texas Education Agency.” There are 28 such affiliated schools in Texas (Jobs for the Future, n.d.). Texas has adopted the National Career Clusters Framework and is implementing all 16 Career Clusters. 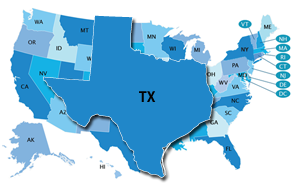 The state makes available more than 120 programs of study covering each of the 16 Career Clusters, primarily through the AchieveTexas inventory. Texas’ state-specific Early Warning System is called the Early Warning Data System (EWDS). Early Warning System data are reported at the student, school, district, or state levels to superintendents, principals, and teachers.